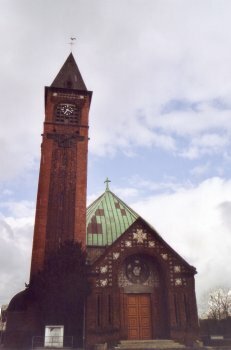 Very few churches were built in Rouen during the XXth century : Saint Jean Eudes church in Les Sapins ( in the suburbs of Rouen) is one of them. It has been built between 1926 and 1929 by the architect Robert Danis and the corporation Lanfry, in a mixed neo-byzantin style. The name of the church was carefully chosen since Saint Jean Eudes is the patron saint of the large families that were numerous in the surrounding housing estates.